James 5:13-16 – If I am ever really sick, I will follow this protocol. I’ll call all the elders of my congregation together and other members of the congregation, as well as my close Christian friends, and I’ll have them pray for me. I’ll also confess my sins. This passage says that the prayers of a righteous person are answered. I think this shows us that that God does not just care about our physical healing. He also cares about our spiritual healing. After all, it is our spiritual condition that brings all manners of illness and bodily breakdowns into our lives that lead us to death. That condition is being a sinner. (Romans 6). This passage from James also shows me that we are to pray for one another, sharing each others’ burdens, lifting them up to the Lord, who alone is the giver and sustainer of physical life. In this passage, there is mention of praying over a person, or as some translations word it, the laying on of hands. This is one passage that church’s derive the practice of laying hands on a person for whom they are praying. However is physical proximity a requirement for healing or answered prayers? Luke 7:1-10 – This passage shows us how Jesus healed a man’s servant from a far distance. The man who made the request was nowhere near his servant when he asked Jesus to heal him. He was however close to Jesus, which I think harkens back to being in a righteous (in a right standing before God) when making our prayer request. Obviously, though being in close proximity to the person who is sick when praying for him or her certainly helps comfort the ill in a way prayer from afar that is also unheard by the sick would not do, if the person is not healed. Luke 18:9-14 – This passage is a parable that Jesus gave. I am connecting this passage to James 5:13-16. James says that the prayers of a righteous man are answered, but who is righteous? In this parable, Jesus tells of a Pharisee who appears to be very righteous and he boasts publicly in his prayers about all that he has done right for the Lord over and above other men. However, there is a tax collector nearby who simply beats his breast and confesses to the Lord that he is a sinner and asks for forgiveness. Jesus says that the tax collector is the one whose prayer is heard, who is justified before the Lord. The Pharisee was not in touch with his own sinfulness. I really think this is key for physical healing, first confessing our sins and receiving the grace of God that comes through Christ, because a person offering a prayer under those conditions, certainly has faith in Christ. A person with that heart position offering the prayer also has God’s kingdom first. You see, God cares first for our heart (our spiritual condition) because if we are not cleaned by Christ of our sins, no matter what healing we receive in our physical bodies, we are still destined to die for the sins we have committed, and we are still facing eternal damnation, which God desires of no one (2 Peter 3:9). James 4:2-3 – This passage connects to what I just shared with the last passage. The heart behind the prayer matters to the Lord. James says we don’t have because we haven’t asked. If we don’t ask the Lord for physical healing, he might give it to us anyways, but if we never ask, then maybe that’s why we don’t receive the miraculous healing. This passage also says that we don’t have if we ask from the wrong motivation; that is from a sinful motivation. Again, confessing sins is connected to prayer, asking that God sets our hearts in alignment with his will, that our requests will be pleasing to him because they don’t stem from our worldly passions and desires. John 14:13-14 – I imagine that this verse is one that raises questions for many people who ask for healing in the name of Jesus, yet healing isn’t experienced, and maybe worse, the person who was prayed for dies. This verse says that if we ask anything in Jesus’ name, he will give it. If the prayer is in his name, it will be inline with his will and it won’t spring from our sinful desires. I’m connecting that statement back to the previous passage from James. However, when it comes to healing, I think it’s safe to say that God doesn’t desire for us to die. I already cited 2 Peter 3:9 to support this teaching. Yet we also know that suffering can benefit believers, as shared by Paul in Romans 5:3-5. Yet, if we ask in his name we should receive what we ask for according to this passage.. so how do we explain this? Not all prayers are answered immediately, or the answer is immediate but we don’t receive it immediately. 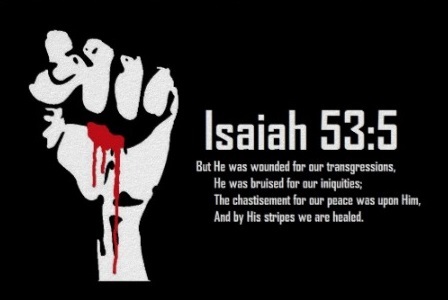 Isaiah 53:5 – We are healed by Christ’s stripes. By his wounds we are healed. First this is spiritually. We are born again and reconciled to God. The complete and total physical healing, doesn’t come until Christ’s return and we are raised to life with new, imperishable bodies as spoken of by Paul in 1 Corinthians 15. This means that if the person is a believer, even if he or she is not healed in this temporary life, that Christian will be healed in the life to come, and therefore Jesus has kept his promise. Romans 8:28 – This verse is certainly a promise from the Lord! It’s important to note that the Lord works for good through all things for those who love him. Those who love him, know him, and are saved. For those who die apart from Christ, we can’t find a good for that individual through their death; they have been cut off from the land of the living and from the Lord of life. Mark 6:5-6 – In Jesus’ hometown, he could not perform many miracles, because the people lacked faith. They didn’t believe. Again and again, when someone is healed by Jesus, he tells them that their faith has healed them. This indicated that it is not just the faith of the person praying involved with miraculous healing, but the faith of the person receiving prayer is also a component to miraculous healing. Daniel 10 – This chapter is fascinating to me. Daniel prays for three weeks straight with fasting. On the twenty-fourth day, he receives a vision. The angel in the vision says that Daniel’s prayer was answered the first day he prayed, but that a demon kept him from getting to Daniel to deliver the message of the Lord. I wonder, if this still occurs. Are our prayers answered immediately, but for some reason, in some way, the works of the devil and the other demons, keep them from arriving to us the moment they are answered? How often has this occurred for us, but we haven’t been persistent in prayer, and thus when the answer comes, we don’t even make the connection that the answer is to prayer? I don’t know about you, but in my sinfulness, I am not always persistent in prayer until I receive the answer. I can’t tell you what I prayed for twenty-four days ago. Mark 8:22-26 – Not all of Jesus’ miracles were immediately complete. This is an example of a partial healing. 1 Corinthians 12:4-11 – Some argue that all of these gifts are not for today. I am not one of those people. In this list of spiritual gifts, we see the gift of healing listed. All of these gifts are from the Spirit and given in proportion to each individual as he sees fit. Because of this, some people might see more healing in response to their prayers than others. Luke 11:5-12 – Fascinating. Jesus says we can be given more of the Spirit when we ask for more of the Spirit. If prayer for healing is a gift of the Spirit… I’ll let you finish that sentence as you pray and think about these verses. These verses of course are not all encompassing of everything revealed in Scripture concerning prayer, and in particular prayer for healing. But they are a start if you are finding this from an Internet search. Please leave some comments if you have more verses to share, or other applications and information about the verses listed here. And feel free to leave questions too. You can contact me personally at andy@contradictmovement.org.